WHAT IS IS AND WHY SHOULD YOU DO IT? Bad luck! Your horse is injured or just doesn’t walk symmetric. You call a vet or physiotherapist to help. Of course, consulting these professional in this case is a good thing, but did you know that a lot of latent problems can be revealed earlier by massage? About sixty percent of the bodyweight of a horse consist of muscles. The health and performance of these muscles is crucial and every equestrian discipline has its own impact on muscles. With dressage, horses are asked to walk in collection, while show jumping requires more of the bullocks and front legs. A massage can have a positive effect, before or after an training/performance, but a maintenance massage can also aid in period of lesser training, f.e. during winter of a recovery. During the massage, the muscles are stimulated and the blood circulation increases. When combined with a stretching program, it will help the circulation even more and the basic metabolism will be activated. The preventive character of these kind of massages will help in early discovery of possible problems and injuries, so one can consult a specialist in an early state to prevent a long-term injury/recovery period. Horses have, like humans, red and white muscle tissue, also known as slow twitch (red) and fast twitch (white). Depending on the breed, a horse can have more or less of each type. Red muscle tissue is more extended, well blooded and more active during long term, equal straining, where the heart rhythm is at a level that the animal is not breathless. White muscle tissue is shorter, less blooded and more active during short term, explosive straining, with a high heart rhythm. This tissue type is more sensible for injuries. Muscles produce lactic acid as a waste product. Too heavy training, training without cooldown or monotone exercises can prevent the complete drainage of this acid, which the remains in the muscles and can cause injuries. A muscle reacts on a trauma (f.e. overpressure) by tightening. If a muscle has no possibility to relax, the tightening can become a cramp (spasm). Relaxation and extension is then no longer possible and the muscle can no longer function normally. Other muscles will try to compensate for the injured muscle, thus getting over pressured as well etc. etc. Especially flexure in the horses’ movement is often a result of this process. Since a horse is a natural animal of prey, it will instinctively do everything possible, not to show its weakness. So if a horse cripples, there is a real problem (which might be a result of a chain of muscle problems). During a regular massage, you can often feel the tightened muscles and the horse will indicate the areas of preference and dislike. Catching these signals in an early state can prevent injuries from happening. Before you start with a massage, it is important to have a good look at the exterior of the horse. Some breed-specific characteristics can cause a bigger strain on some of the muscle groups. Some breed f.e. have problems extending their back while lowering their head. If a horse has a natural swayback walk, it will strain its breast- and abdomen more. A good rider can help the horse by training specific muscle-areas, but via massage, a supportive “training” can be given. Another known cause for problems is an abnormal hoof- or leg position, causing extra strain on the ligaments and muscles, who try to compensate and may get overpressured. Horses with unequal hoofs often show problems in the shoulder area. In nature and in natural housing, horses can alternate walking, eating and resting as they wish and they can freely react to one another. The horse are always “warmed-up” naturally and can drain the lactic acid their muscles produce. Body and mind are in balance, which enhances the performances. However, it is not always possible to accommodate your horse in a group facility, so there a massage before a training can help to warm-up the muscles and prepare them for the more intensive work. An extensive grooming session might also indicate pain points and favourite spots. If you have a possibility to look at a herd of horses, you can easy see how they groom each other. They know exactly what is needed where. Since horses are naturally “waking feeders”, the have a natural flexure as they walk with two-third of their weight on their forehand. This may strain the muscles on the forehand too much, causing injuries, especially with young horses. 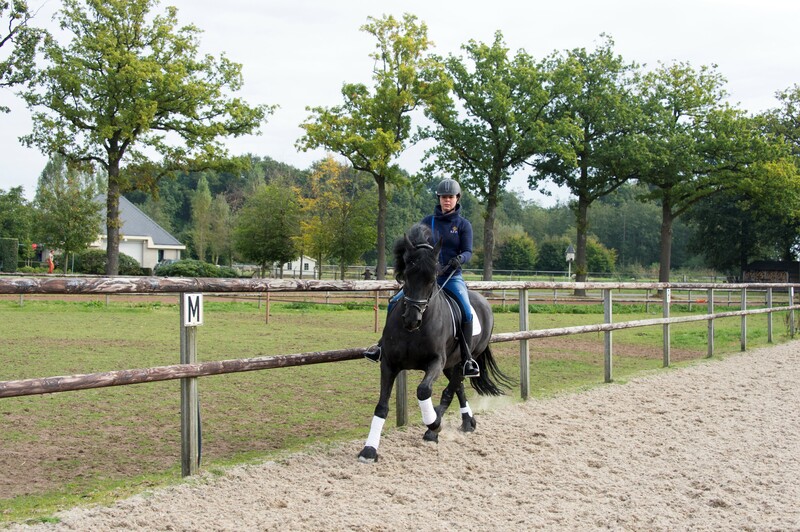 The whole spectrum of dressage is based on shifting weight towards the backhand of the horse. This divides the weight of the rider better and the pressure on the whole muscular system (muscles, ligaments, bones etc.) will be more equalized. Conditioning the horse will then also be easier. Next to the natural horizontal flexure, most horses also have a favourite lateral flexure, like we humans are right- or left-handed. This poses no problems in nature, but is we ride and train the horse, this may result in more wear and overpressure of the most strained side of the body. Therefore it is very important during your training, to put extra effort in straitening your horse movements. Massage can support to help the horse to use his weaker side more. Unnatural flexure is also known as the symmetry in joints/vertebras. F.e. a flexed atlas (first vertebra in the neck), a flexed shoulder or pelvis or vertebras that are not aligned. Unnatural flexure almost always has an external cause. The horse has fallen, slipped or was clamped in the stable. This flexure is however also always compensated in the muscles. Massage can, unfortunately, not remove an asymmetry in the vertebras, but can be used as support, often together with some special treatment. Bones and cartilage tissue have completely different properties and complement each other. Bones are stiff and strong, cartilage is weaker, but supple, elastic and smooth. A lot of the cartilage of a new born foal turns into bones over the years. Until the maturity of the horse, the growth in both direction (long and wide) is very important. The growth in both directions can be simultaneously, but often we see a length-grow first (the horse grows and gets bigger), but the thickness growth may take a lot longer. This is often seen especially in the legs of horses. This is something to keep in mind during training. Exercising stunted legs too hard, may cause unnatural flexure. There are only a few horse with perfectly build legs. Most horses have small deficiencies that are physically not important. There are however some deficiencies, that increase the change on lameness. Often, they are caused by an unequal distribution of the joint on the leg. The leg should be ideally straight. If it stand a bit to the inside or outside, the pressure on some elements is higher than on other. This may cause injuries or unequal wearing hoofs. Some equestrian disciplines increase the amount of pressure more than others. Often, horses are specifically bred and talented for a specific discipline like dressage, show jumping or western riding. A right training program, both under saddle as with groundwork, is in all cases very important. As important as the right balance in “exercise” and “rest”. More than sixty percent of the horses’ body consists of muscles. Removal of muscle knots and adhesions. Keeping the horses’ body in a better condition. Early indication of pain points, wear and latent injuries. Increase of the production of synovia fluid, which greases the joints. 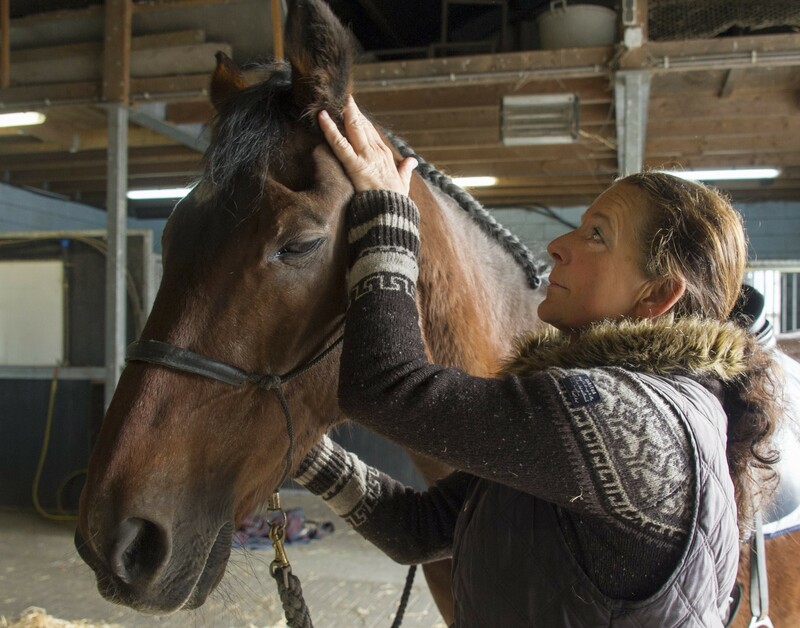 A horse that receives massage is often easier to treat and after a manipulation the recovery is supported. In case of an active therapeutic treatment, always tune with the therapist before massaging. A massage is best ended with some stretch exercises. Martine often combines massages with Reiki treatment. Horses massage each other by grooming in the herd and so pass on energy. If you have the time to study the behaviour in a herd, you will see that a horse will automatically walk away, from the grooming horse, if extra energy is not needed anymore. This fact can also be used during massage. Before or during a massage, if your horse is restless or you feel spots that need deeper energy, you can use reiki. Horses, but also other animals and children are pure in their reaction and will “tell” you exactly what is happening during the treatment. Martine du Floo: “I have many experiences where a restless horse became relax again using Reiki. After the treatment, reactions can occur with the receiver because the self-healing process of the body is activated. These reactions can ben both physically and mentally. F.e. a horse can be more joyful, start eating more or start yawning. Reiki is an old Japanese healing art, which was rediscovered in the nineteenth century by a Christian monk, Mikao Usui. Reiki means “universal life energy” in Japanese. We are all born with this energy, but during or lives our energy can get polluted, causing the free flow of energy to block. A good example of this is the natural reaction to put you hand on the sour spot after an injury, as well as giving comfort to people by touching them. So Reiki exists in all of us. Cindy van Laar is the owner of two Frisian mares, Ida (v. Tsjomme) of 22 year is Z2 dressage and Nienke (v. Djurre) of 20 is L1 dressage. Cindy attended the course “Basic preventive horse massage” with Martine du Floo and states to have learned a lot from this. 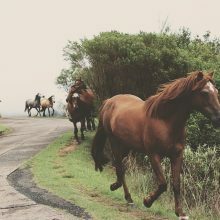 Classical Homeopathy For Horses – What Is It And What Does It Do?